Free Ambulance Service In Mogadishu Is Running Low On Cash : Goats and Soda It's been a welcome alternative for Somalis in Mogadishu. But now, says its founder, it may have to cut back. Mogadishu's free ambulance service was founded in 2006 by Dr. Abdulkadir Abdirahman Adan after he saw people bringing relatives to the hospital by wheelbarrow. Dr. Abdulkadir Abdirahman Adan, who is from Somalia, trained as a dentist in Pakistan. When he returned to Mogadishu, in 2006 to begin practicing, he was distressed by what he saw: People getting hurt or killed near his office in Bakara Market, the result of a long-running civil war in his country. "The people were using wheelbarrows for taking victims to the hospital. Even pregnant [women] were taken in wheelbarrows to the hospital," he says. "I asked myself, 'What can I do?' I decided to start my own ambulance, a free ambulance," he says. At first, the health workers treated people who were hurt in accidents or the ongoing violence. The organization now helps treat and transport pregnant women and patients with chronic illnesses – anyone who needs to go to a hospital. 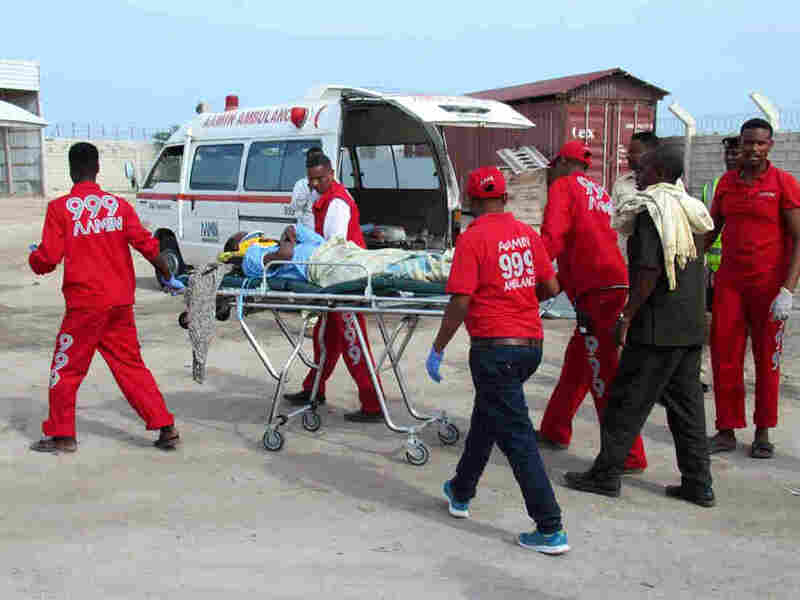 People in Mogadishu dial 999 to reach a dispatcher. But after 12 years, Adan, age 45, says Aamin Ambulance is in financial trouble. The service is funded by donations, and donations have not been enough to keep up with the services Aamin Ambulance provides. Adan says he spent $4,200 of his own money for the organization's first ambulance, and Aamin grew as he solicited donations from businessmen, family, friends – even his own students. The United Nations Development Programme has donated walkie-talkies, he says. He says his service is the only ambulance in Mogadishu, a city of 2 million, that's free. Currently there are 16 ambulances, but Aamin can only afford to operate 10 of them. "We will not close completely, but I think we will reduce the number of ambulances," he says. "We will reduce the number of staff, we will reduce the time and hours of paramedics, and so on." Aamin Ambulance staff can be the first to respond to an emergency. A year ago, a truck explosion attributed to al-Shabab killed more than 500 people and injured hundreds more. Adan, who sometimes drives an ambulance or serves as a paramedic, says he was one of the first people on the scene, where he saw "a lot of cars burning, collapsing buildings, and many people crying and saying, 'Can you help us?'" "We transported more than 250 people, and almost 80 dead bodies," Adan says, adding that while the city has been relatively calm in recent months, an attack "can happen at any time." Apart from the service provided at times of violence, Adan worries that if Aamin Ambulance is forced to reduce its operations further, people could die even when they need more routine care. "If they don't get early response like an ambulance, they will be at risk," Adan says. He adds that while some private hospitals may have ambulances, they can be difficult to access and cost money that patients may not have. "The only hope they have is the [free] ambulance," he says. Adan says it costs thousands of dollars a month to run Aamin Ambulance, and that with more money, he could run all 16 ambulances. He sometimes takes donations in the form of fuel or tires to keep the organization running. And he chips in as well. "Before I pay my bill to the house," says Adan, "I first pay to the ambulance."